These are probably my favorite cookies in France. I certainly like other cookies, but I always come back to the Petit Ecolier (the little schoolboy). It's the classic Petit Beurre (little butter cookie) with a tablet of chocolate on top. The cookies pictured are made with milk chocolate, but there are versions with dark chocolate, and chocolate with hazelnuts, too. Four Petits Ecoliers make a good dessert. And they're good with red wine! The manufacturer is LU, which stands for Lefèvre Utile, a baking company in Nantes down on the Loire estuary. It was established in 1846 and remains among the most famous of cookie brands in the country. Their signature cookie is the Petit Beurre, a simple butter shortbread cookie instantly recognizable in France. 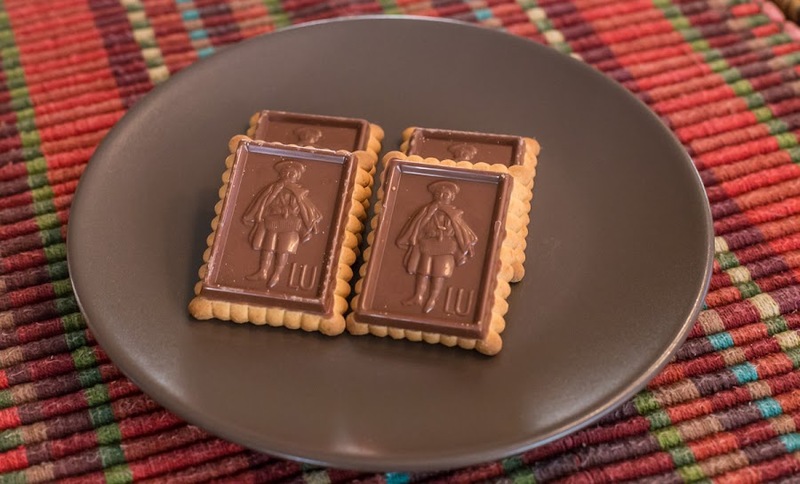 The addition of a slab of chocolate molded to include the shape of a schoolboy holding a basket and a cookie turned it into the Petit Ecolier. A funny aside: many years ago Ken and I were in a shop in Rouen, Normandy. Ken bought a ceramic hotplate trivet made in the shape of a Petit Beurre cookie. The shopkeeper, realizing we were English-speaking foreigners, asked if we knew what the plural of un Petit Beurre was. We looked confused, I'm sure. He smiled and said, "Des Touyoux!" We probably looked even more confused than before. Then he sang out, "Un Petit Beurre, des Touyoux!" which sounds remarkably like "Happy birthday to you!" Maybe you had to be there, but we've never forgotten the good laugh we had that day. We were on the back end of a storm that went through over night. At one point, around 01h00, I remember hearing some stiff wind outside. But I slept pretty well otherwise. We got some rain, but not a lot. North of us, however, and up into the Paris region, they got a few inches of snow. The vineyards look dull and lifeless, but the grass is green. I can feel the days starting to get longer now. I find myself looking out the windows, especially when there's some sun, thinking of all the things to do as the weather gets better. Like picking up fallen twigs, cleaning up flower beds, power-washing the deck, and planting seeds for the summer garden. I'm already looking forward to barbecuing again. Soon enough. When I posted those old California camping photos, I mentioned that we pulled a trailer across the country the month before we moved to France in 2003. I remembered that there was a photo of the trailer somewhere, but I couldn't find it. Until now. We hauled a bunch of stuff to Ken's mom's place in Carolina. I think it was late April or early May. We drove down to southern California to see our friend CHM, then on through Arizona and New Mexico, where this photo was taken. From there we continued east until Oklahoma where we turned north a little and headed to central Illinois to see friends there. After that, we pointed the car toward North Carolina, drove through some scary tornado weather, crossed the Smoky Mountains, and continued to the coast. We stayed in coastal NC for about a month before I sold the car. We rented another car and drove up to Washington, DC, where we (Ken and me and our dog Collette) boarded our flight to Paris. 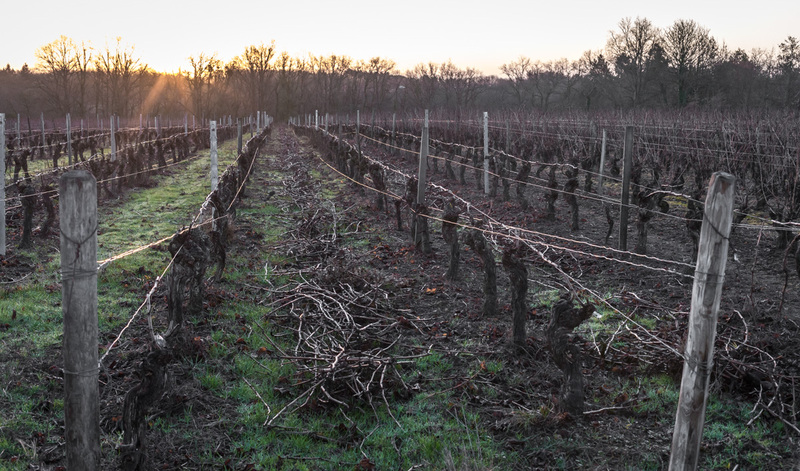 As the days get lighter, the grape vines out back get pruned. The process is a little different this year because the biggest grower has new workers doing the pruning. I'm guessing that they're a team of seasonal workers, hired to go in and prune parcels quickly. Some cut, others pull the cut canes off the vines and line them up in between rows for mulching. This parcel is owned by a smaller grower. He and his wife do all the work themselves. 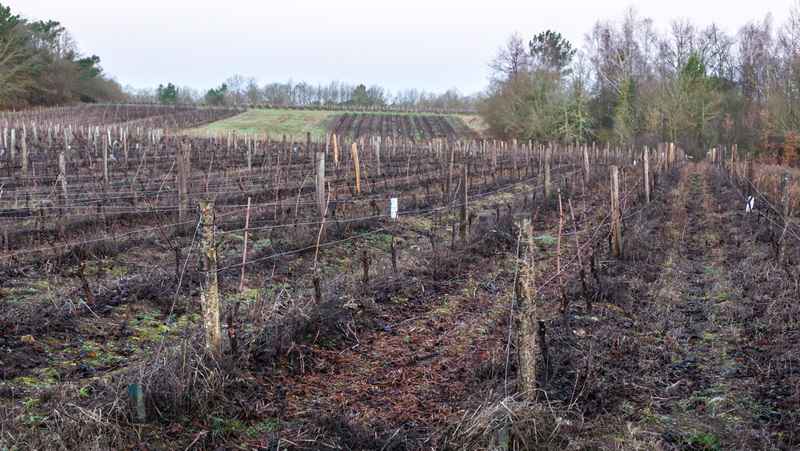 You can see that the vines have been pruned to a single cane and the cuttings have already been mulched between the rows. Next, they'll bend the single canes to the horizontal and attach them to the guide wires. Up until last year, there were three permanent employees who did the work. We would see them nearly every day of the year doing one thing or another out among the vines. One we know left over a year ago. And now we haven't seen the other two since last year's harvest. Oh well, change is our friend. Remember when I wrote that I had read that people eat topinambours (jerusalem artichokes) raw in salads? On Friday we tried it. I peeled a few nice looking topinambours and sliced them very thinly with a mandolin. I arranged them on plates and dressed them with sherry vinegar, olive oil, and salt and pepper. Then I made a layer of shaved mimolette cheese and topped it with some sprigs of cerfeuil (chervil). The chervil is fresh from the garden where it's still growing, despite a few minor freezes. The salad is a variation on one that I've been making for years. I just used the topinambours in place of the black radish in the original recipe. 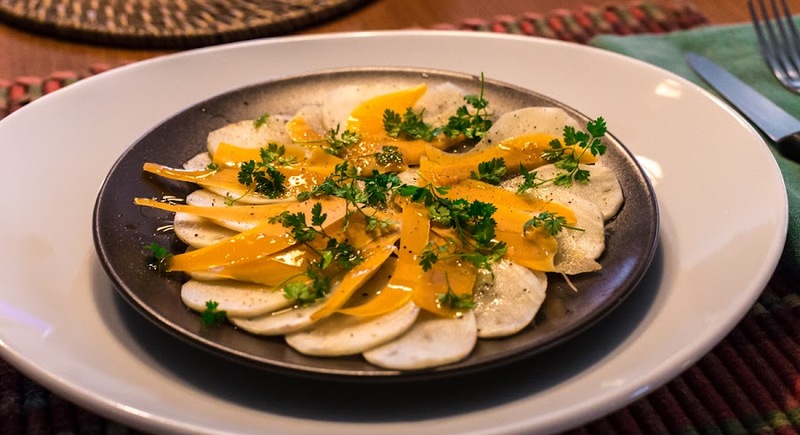 Instead of the sharp peppery flavor of the radish, the topinambours have a much more gentle flavor, almost sweet by comparison. We both think we like it even better than the radish version. In French, the word pomme means "apple," the sweet fruit we're all familiar with. But, combined with other words, it takes on other meanings. Perhaps the most well known of these is pomme de terre (earth apple) which means "potato." Less well known is the pomme (or sometimes pommeau) de douche (shower apple), what we call a "shower head." A pine apple, or cone, still attached to a fallen branch. Then there's the pomme de pin (pine apple), what English speakers now call a "pine cone." The word cône exists in French and is probably more scientifically correct (I'm guessing here), but I've always heard these called pommes de pin. What we call the tropical fruit "pineapple" is known as ananas in French. I read that the tropical "pineapple" was originally called that in English because it resembles, you guessed it, a pine apple. I stopped into a bakery the other day for some bread and saw these. Dessert! They were as tasty as they look. 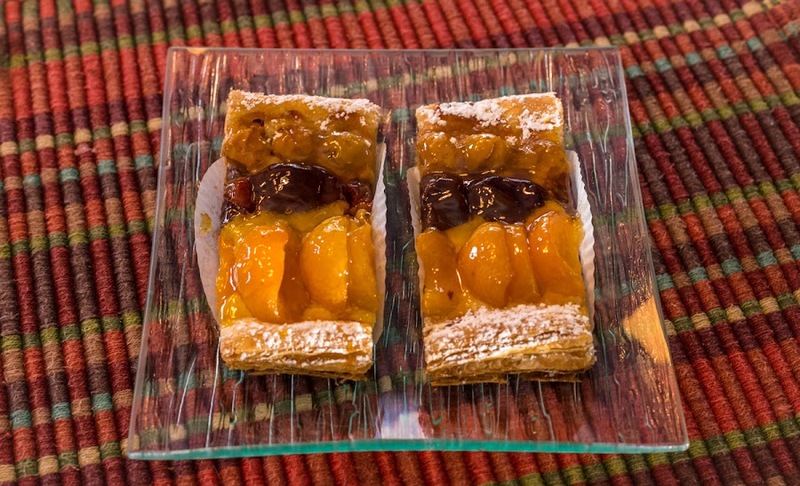 Three kinds of fruit on a flaky pastry crust. As with many small French bakeries, the business is a family affair. The baker makes the bread and pastries in the back of the shop while his wife/partner works out front, selling the products. In this bakery the couple is pretty young, probably in their late thirties. They make beautiful breads, quiches, pizzas, and pastries and pies. Below is the top of the box in which Madame packed the two tartelettes that I bought. 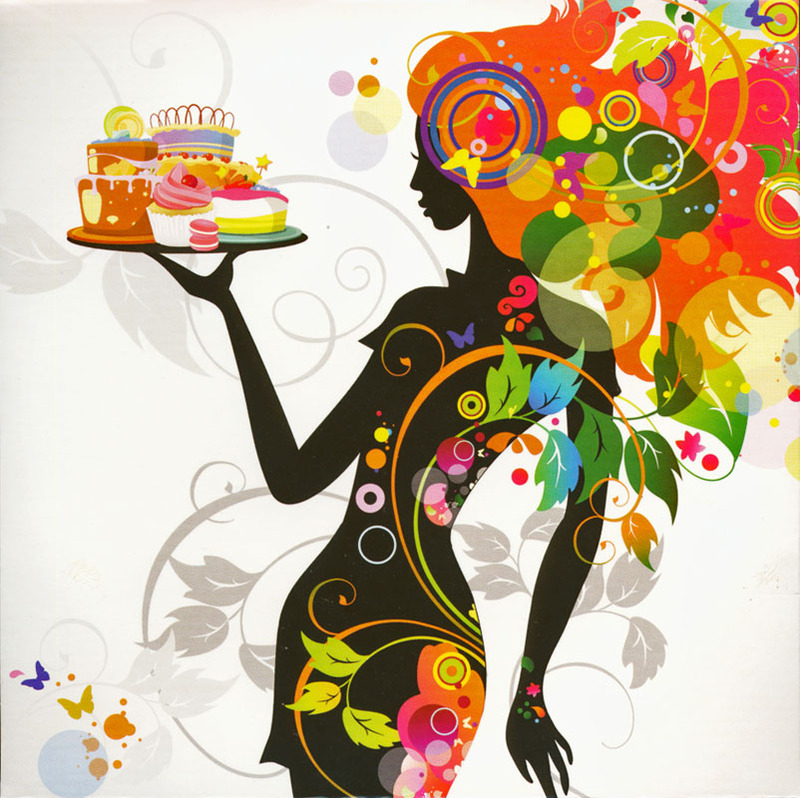 Lucy in the sky with pastries. And speaking of pastries, I went to the supermarket on Thursday. 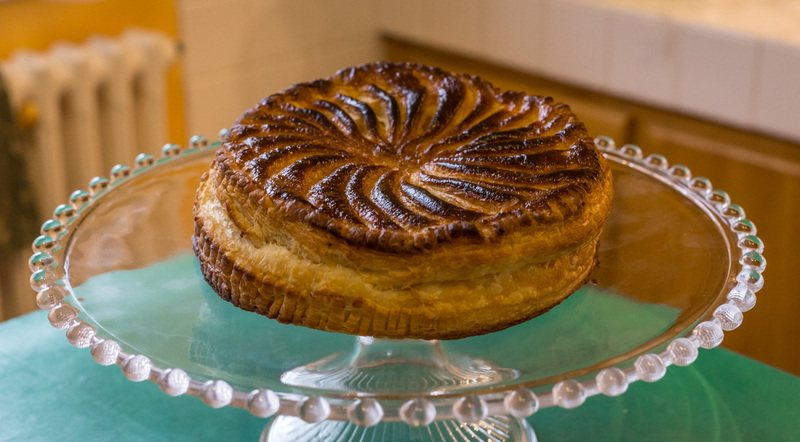 They were giving away a galette des rois (king cake) to customers who spent at least 45 euros. I'm sure they were trying to get rid of their unsold surplus since the time for galettes is passed, but that's a nice way to do it. And it wasn't stale or old-tasting at all. This is one of the views of our little hamlet from out among the grape vines. It's looking roughly toward the northeast. I can make out five of the nine houses in our little group, including ours. The other four are a little farther down the road, behind the buildings you can see in this photo. Our hamlet on the southern heights above the Cher River valley. 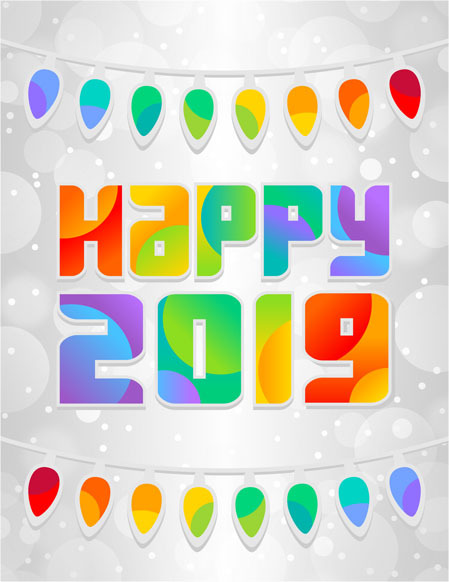 Click on the photo to make it bigger. I can also see a few cars parked on the dirt road that runs through the vineyard. They belong to the crew that was out pruning on this particular morning. A few of the workers pass through, cutting the vine canes, while the rest of them follow behind and pull the cut canes off and line them up on the ground between rows. Later, someone will come through with a grinder and mulch the cut canes. With apologies to those of you who have "real" winters... We had a snow squall on Tuesday. It started out as rain, then changed over to snow. Some of it started sticking to the wet ground, but it melted away pretty quickly after it changed back to rain. The view is from the deck outside the living room, panning from south to north. One month from today, Tasha will be two years old. She's a wonderful dog, but I may be a little biased. It's fun to watch her learning words and commands and generally growing up. It's hard to explain, but it's real. If you've had a dog, you will most likely understand what I mean. Tasha dropped the stick on the ground in front of her feet the moment I pointed the camera at her. 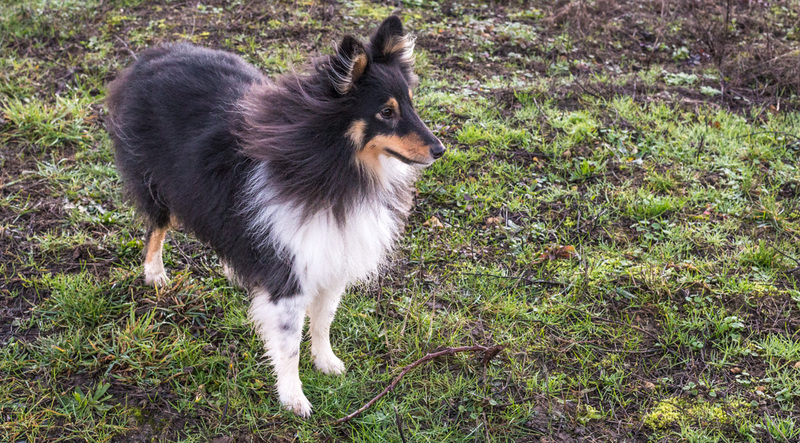 Tasha has learned that it's fun to find a stick, most often a piece of grape vine, and carry it around for a while. You might remember that Callie, our border collie, used to bring grape trunks home from her walks. 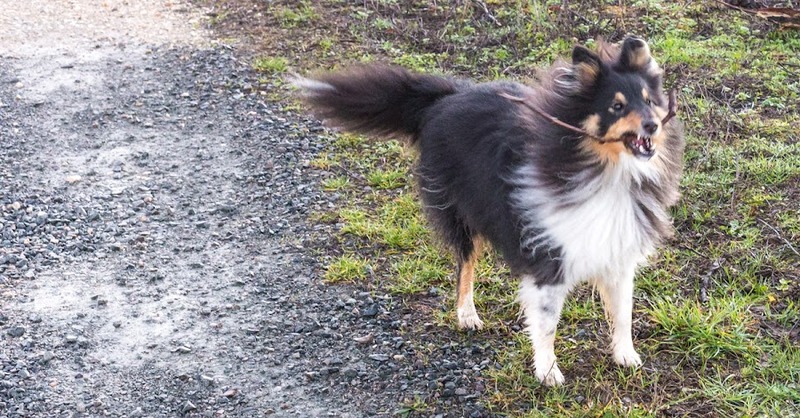 Tasha is too small for that, but she does like to carry a small stick around for a while. I did manage to get a motion shot of her with the stick in her mouth. When she's not carrying a stick, she's jumping up on me and trying to get me to play. When it's muddy outside, she gets my jeans all wet and dirty. But I don't really care. It's all in a day's fun. When I made the galette des rois earlier this month, I had some pâte feuilletée (flaky pastry) left over. I froze it to use another time, and that time was Sunday. I decided to thaw the dough and roll it out to make some croissants. Six little croissants fresh out of the oven. I was able to make six croissants, but they were small. I probably should have made only four, but no matter. I also wonder if I didn't roll them too tightly, since the insides weren't as flaky as they might have been. Still, they tasted good. Cut and rolled croissants, before getting brushed with an egg wash.
Over the years I've learned to make a decent flaky pastry dough. I've also learned that it needs to be baked in a hot oven, about 220ºC or 425ºF. That way the butter cooks the flour and doesn't melt out of the dough. I've made soggy messes with flaky pastry in the past because the oven wasn't hot enough. No more! During baking, the points detached a little and puffed up to look like scorpion tales. Oops. Once the dough was rolled out into a rectangle, I used a pizza wheel to cut the rectangle in two lengthwise, then into six triangle shapes. 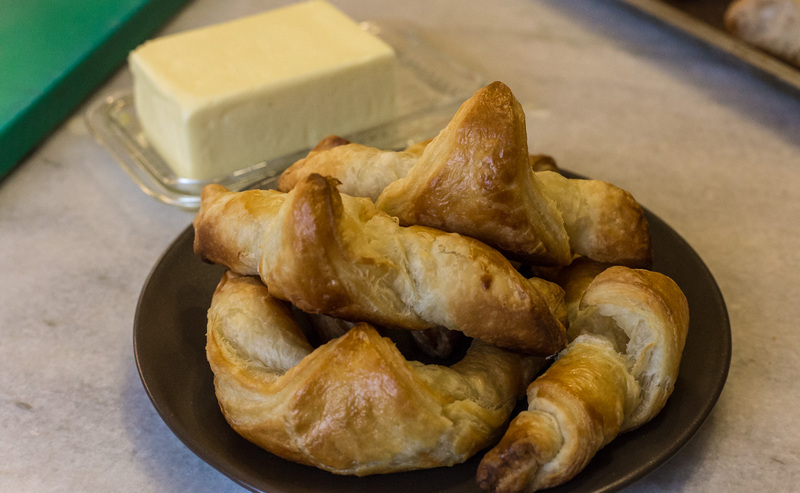 I rolled the triangles from the wide end to the point and used a little water to seal the point to the rest of the croissant. Finally, I brushed them all lightly with an egg wash before putting them into the oven for about ten to fifteen minutes. On Saturday morning, the temperature dropped just below freezing. That was enough for heavy frost and icy windows, and to make the dirt road out through the vineyard slippery. But we got no snow, just a little rain. I had to be very careful walking the dog. I managed to stay upright, but Tasha slipped on the slick ground and went down. No harm done. 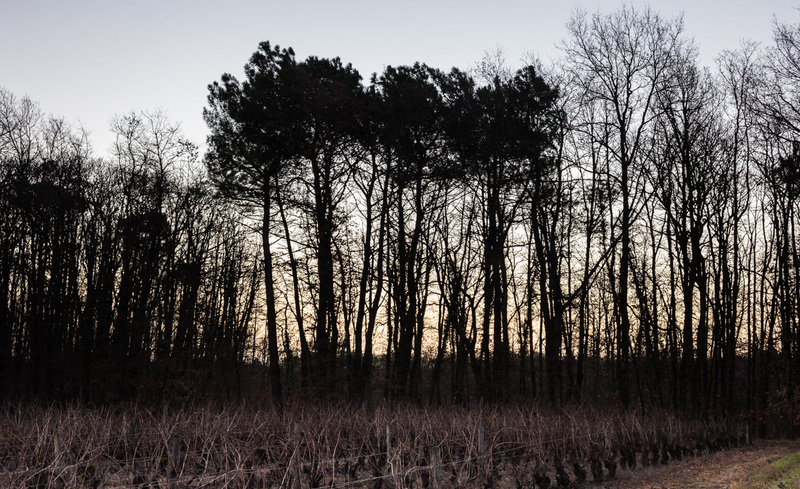 A tall stand of pines at the edge of the vineyard just before sunrise. This morning it's raining again, with our morning low well above zero. January and February are normally the coldest of the winter months around here and we frequently have a minor snow event or two during that time. So far, things have stayed relatively warm with no sign of snow. Our neighbors would say that we need a few good freezes to kill off the pests. We will see what February brings. These are Jerusalem artichokes. Or, as I've heard them called, Jerusalem fartichokes. That is a reference to their propensity to induce digestive distress, i.e. gas. And it's true. But they taste really good, so it's a worthy trade-off. The have the firm, crunchy texture of water chestnuts, and a similar flavor. They're good steamed and eaten just as they are, or made into a purée with or without the addition of potatoes. I've read they can be sliced thin and eaten in/as a salad, but I've not tried that. Yet. Topinambours, not in the sun. On Thursday, Ken baked them in the oven in a tasty broth, with a few potatoes and herbs, until the vegetables were tender and the liquid was almost completely boiled away. We ate them along side a couple of Toulouse sausages. Yummy. And yes, they did as they are known to do. Pardon me. This is winter jasmine, given to us by our friend CHM who took cuttings from a plant that grows in his Parisian garden, if I'm remembering correctly. We've had it for a few years and, not too long ago, transplanted it into this large pot that sits outside the greenhouse. 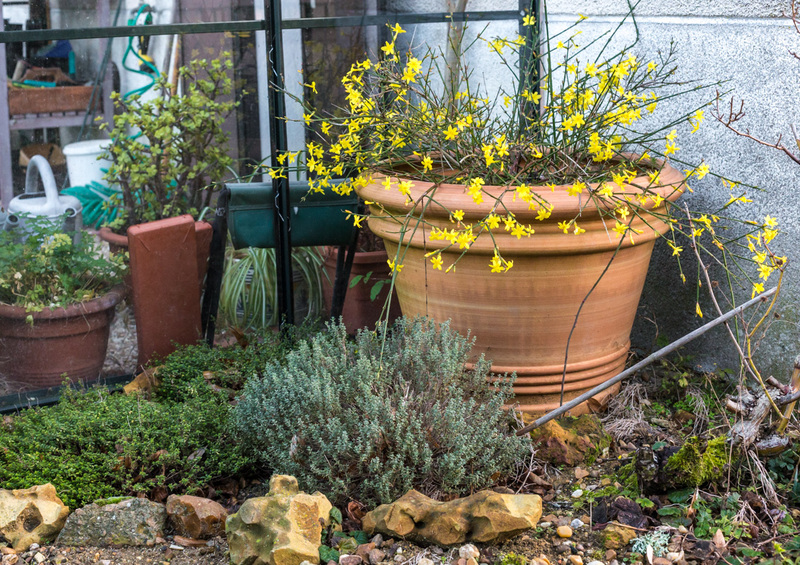 Winter jasmine, a January bloomer. This is the time of year that it blooms, and it's looking pretty good this year. It should get bigger as time goes on. At the base of the pot are three varieties of thyme that I planted after the greenhouse was built. I really need to get out with the camera. I'm reduced to taking pictures of produce. And it's not even tomato season. 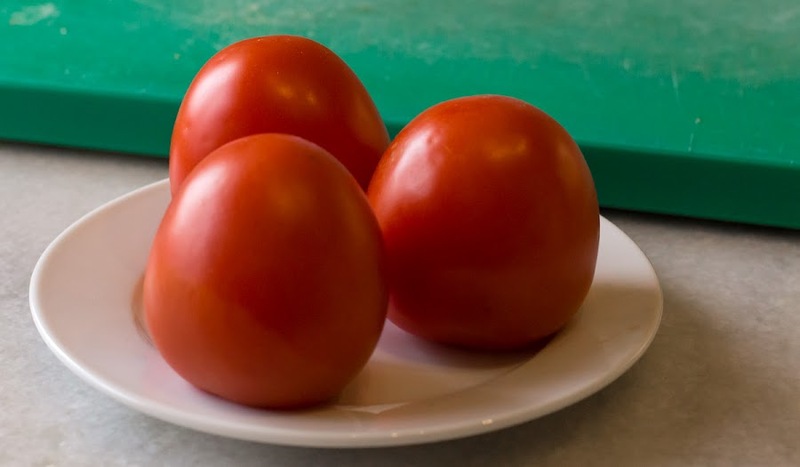 We try to eat seasonally much of the time, but once in a while you need a fresh tomato. Even if it doesn't have the flavor of the end-of-summer home-grown varieties. They look good. How will they taste? Ken picked up a bunch of tomatoes at the supermarket the other day. Some went into the tacos we made for lunch that day. These are the rest, slated for a salad today. As for seasonal vegetables, we're eating plenty of those. Cauliflower is gorgeous right now, we found some nice Brussels sprouts last week, and yesterday I got a bag full of nice looking topinambours (jerusalem artichokes). Maybe I'll take a picture of those. 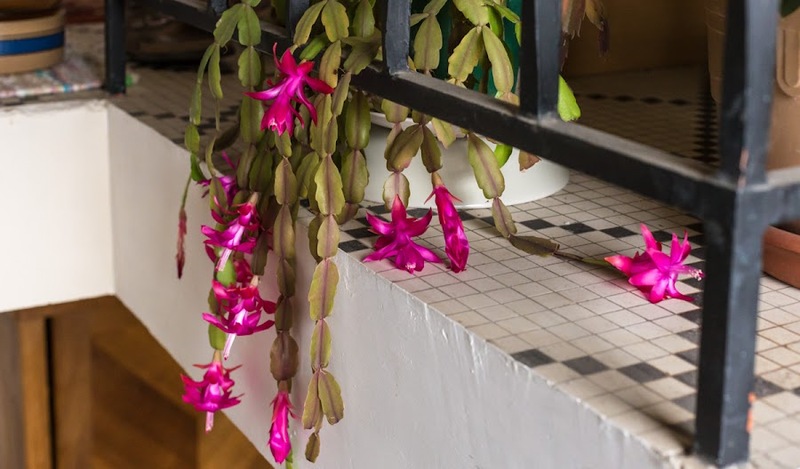 When we arrived in the house back in 2003, we found a Christmas cactus left behind by the previous owner. It wasn't in great shape, but it was alive. Over the years, Ken rooted cuttings from it so that now we have at least five cactus plants going in the house. This one was out on the deck during some of the freezing weather we had in early December. I thought it was a goner. It's looked better, but it definitely has recovered from being brown and shriveled. But we brought it indoors and watered it, and it kind of came back. Then, over the past week or so, it blossomed. The other cacti in the house have buds, but they haven't opened yet. I used to call them the President's Day cacti, since they had a tendency to bloom in February. But they may need to be renamed as Martin Luther King Day cacti this year. That's the French word for Vietnamese fried egg rolls. France has a history with Vietnam, and the exchange of food is probably one of the more significant legacies of that relationship. Aside from the war. But I digress. The ingredients, assembled, for making nems. 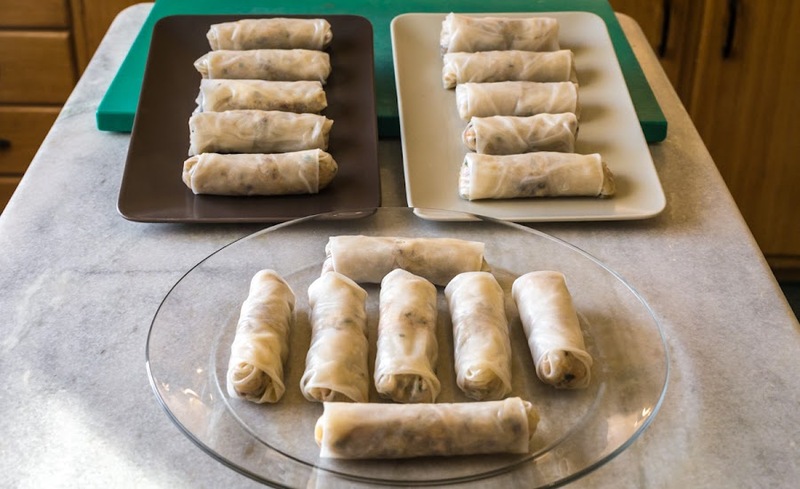 We've made nems before, but it's been a long time. These days we find them easily in the supermarket. But I decided it would be fun to make some again, so a few months ago we got the wrappers from the Asian store. They're rice paper wrappers, dried and intended to be softened in water before use. The filling on the wrapper, then I rolled it up, folding in the ends to keep the filling inside. I pulled together all the ingredients for the filling. For the meat, I used finely diced chicken, leftover from the capon that Ken roasted the other day. 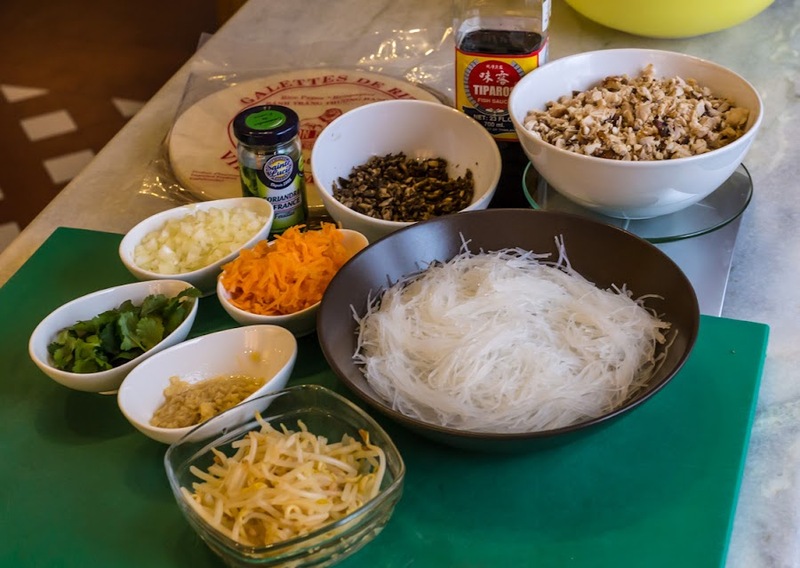 The other ingredients include rice noodles (I used soy bean noodles), minced onion, carrot, ginger, and garlic, bean sprouts, nuoc-mâm (Vietnamese fish sauce), and some fresh and dried cilantro. I also added finely minced white mushrooms, squeezed to eliminate their water. I got seventeen nems (Vietnamese egg rolls) from the batch of filling that I made. No photos of them cooked. Sorry! 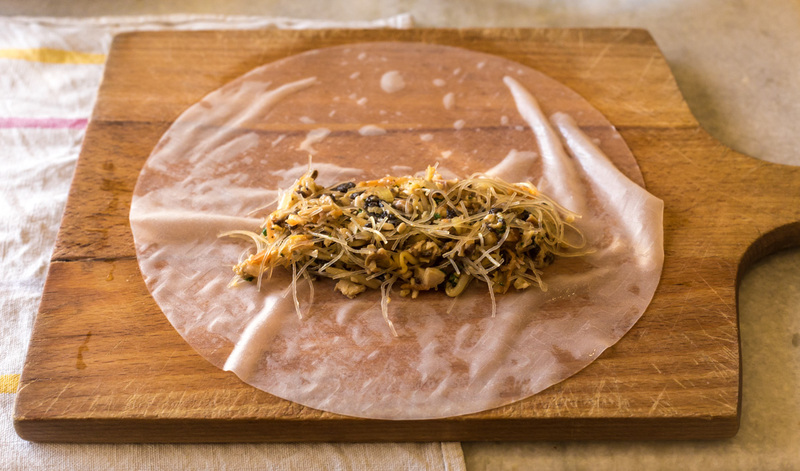 I soaked the rice paper for thirty seconds in warm water, then stuffed each one, wrapping and rolling them to keep the filling in. The first batch got deep-fried in oil. That was a mistake. They burst open and the filling started to ooze out. They tasted fine, but looked awful. I baked the second batch in the oven with much better results. The rest, about half, went into the freezer for another time. They will be baked in the oven when it's time. This will be the last installment of this mini series from October 2002. We left Death Valley and headed even further south, through the Mojave Desert and on to Salton City and Borrego Springs. 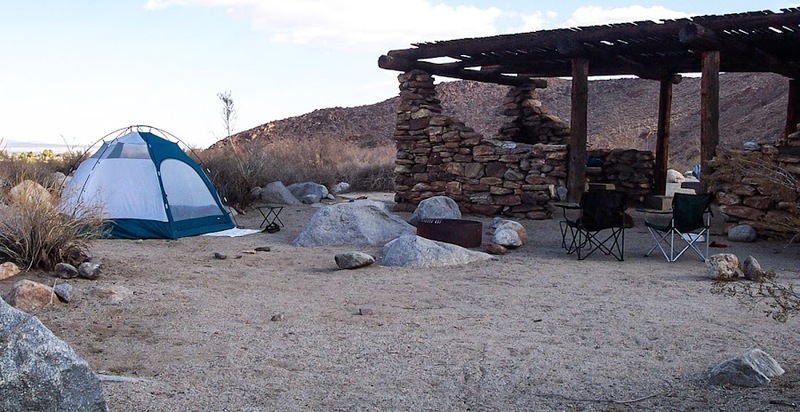 We had a campsite reserved in the Anza-Borrego State Park. Again, there were very few campers around and we had a great choice of site. 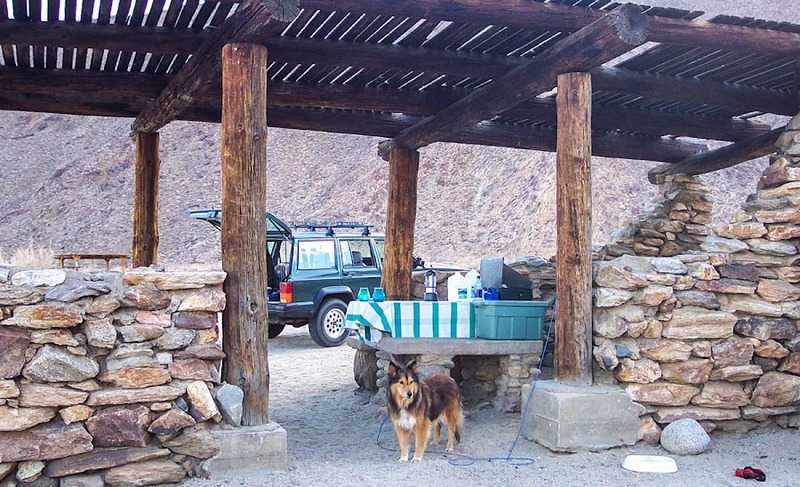 The rustic shade shelter and stone picnic table at our site, with the Jeep and Collette, of course. Some of the sites available included beautiful stone shelters with log roofs for shade. Inside each shelter was a picnic table and a stone fireplace built into one of the corners. We chose a site with a view out over the valley to our east. By the way, our dog Collette loved riding in the car and sleeping in the tent. And, although having a dog along restricted what we could do, we wouldn't have had it any other way. 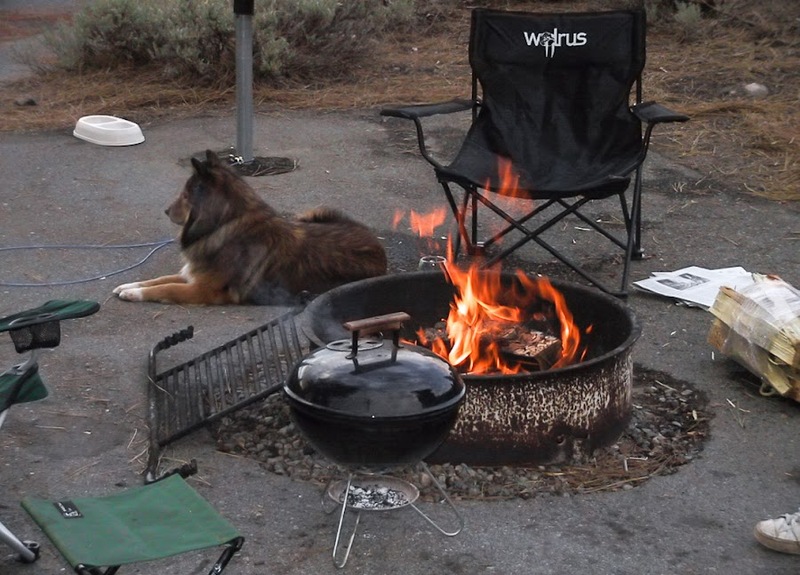 In addition to the fireplace inside the shelter, we had a steel fire pit surrounded by a circle of boulders on the oustside. We pitched the tent at the edge of the site. There was nothing but desert to our north and east and it almost felt like we were the only people there. On our walks around the campground loop with Collette, we could see bighorn sheep up on the rocky slopes of the mountains that bordered the campground on the south and west. Our shelter and tent on the edge of the campground. After a few days in Borrego, visiting our friend CHM (who lived nearby), and even taking a ride up the aerial tramway in Palm Springs (we left the dog in the care of a friend for the afternoon), it was time to head back north toward San Francisco. 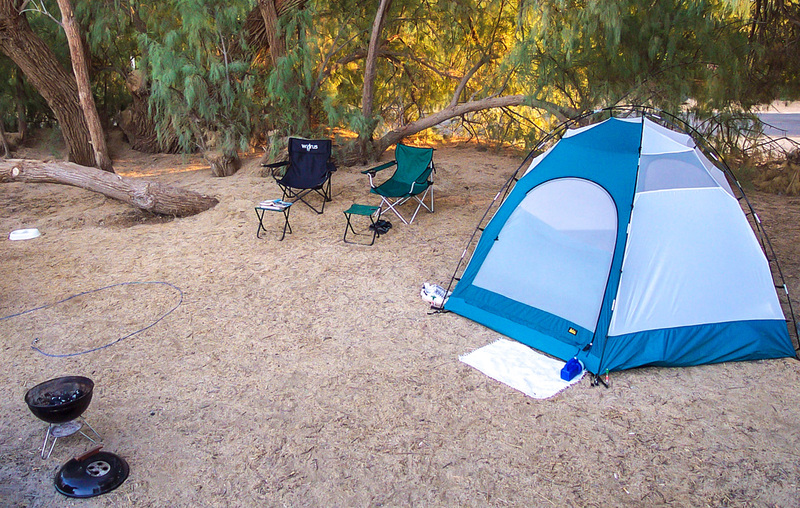 We drove out through Los Angeles and headed up to Santa Barbara where we had a reservation at a beach campground for one night. The next day we crossed the mountains back into the Central Valley, visited a winery there, then drove home. There are lots of old photos from this trip; the images I posted here are just a few. Ken's shots are digital, and I have slides packed away. It was a lot of fun to look through them again.Thanks for coming along! After our chilly night in the tent, we spent the next night in a motel. That next day we visited the ghost town of Bodie, then saw Mono Lake, but not for the first time. I can't remember if we spent a second night in the motel, but we might have. The good ol' Jeep at our Furnace Creek campsite in Death Valley, California, 2002. Our next destination was the Furnace Creek campground in Death Valley. We had been there once before and wanted to go back. We had no problems with cold there. It was hot, and we didn't need the rain tarp on the tent. It was nice to feel warm again. 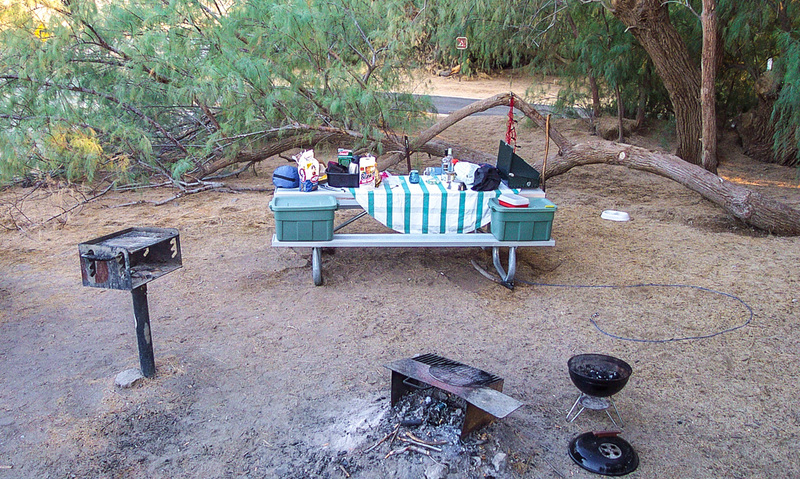 Our semi-organized table, with camp stove, Brawny paper towels, and a bag of charcoal briquettes, among other things. I've forgotten how many days we spent, but we did some riding around to see the sights. Behind the campground was a golf course. I thought it was strange to wake up to the sound of sprinklers watering the greens in the middle of Death Valley. We saw a few coyotes nearby while walking Collette. She was interested, but we had to keep her on the leash. Coyotes are dangerous where domestic dogs are concerned. Another view of the site. That's our little Smokey Joe grill on the left. We still have it! We also still have the tent and those chairs. After Death Valley, we headed south again. We were going to see our good friend CHM, who spent time in the Southern California desert back then. More tomorrow. Just a few more shots of our first day out on this trip back in 2002. The car is my 1992 Jeep Cherokee Sport. It was a great vehicle. I was commuting in it at first, but after I got the job in the city I used the subway to go back and forth to work. The car became our weekend errand and recreational vehicle. The '92 Jeep with its roof rack and "basket case." I fitted the Jeep with a roof rack for bikes, then I got an attachment for the rack called "the basket case," or something funny like that. We could load the basket with camping gear and tie it all down to the roof. That left us a lot of room inside for other stuff, including our dog, Collette. Ken and Collette taking a break from setting up camp before dinner. Notice the wine bottle on the table. Priorities. 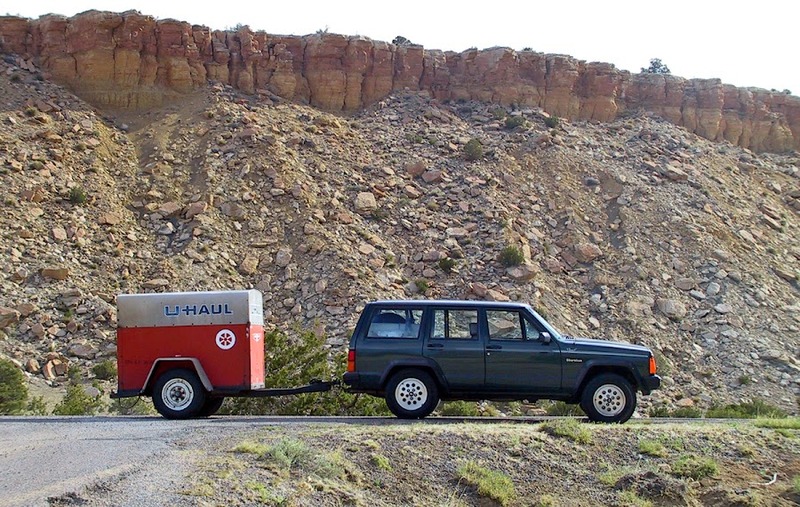 The following year, as part of our move to France, I had a trailer hitch installed on the Jeep and we pulled a U-Haul trailer across the country from San Francisco to North Carolina. We planned to spend a month in Carolina where I put the car up for sale. Shipping a ten-year old American car to France was not a practical option. We had a nice fire that evening before bed time. Then it got colder. And colder. It wasn't until just a few days before we were scheduled to fly out that someone bought the Jeep. Ken's mother saw it around town a time or two after that, but then we all lost track of it. I'm sure it's no longer on the road as it would be about 27 years old now! Set the WABAC machine to October 2002. 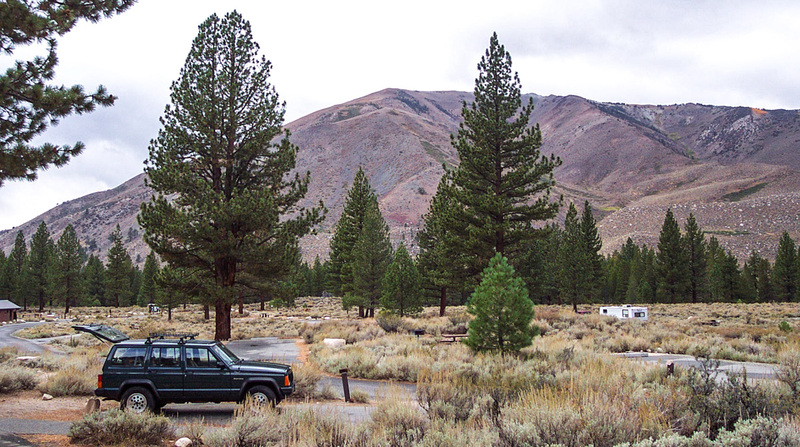 Ken and I took a camping trip through eastern California. 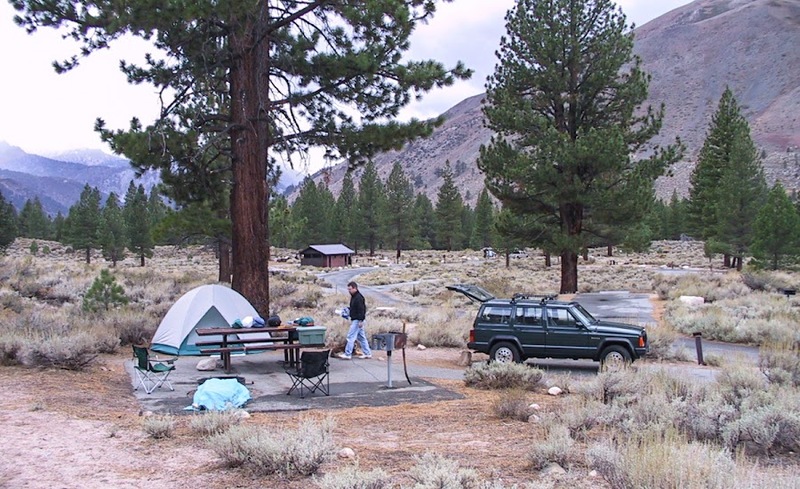 We left San Francisco and headed up and over the Sierra Nevada mountains to our first destination on the eastern side, a campground near Twin Lakes. At some point, we stopped for lunch. 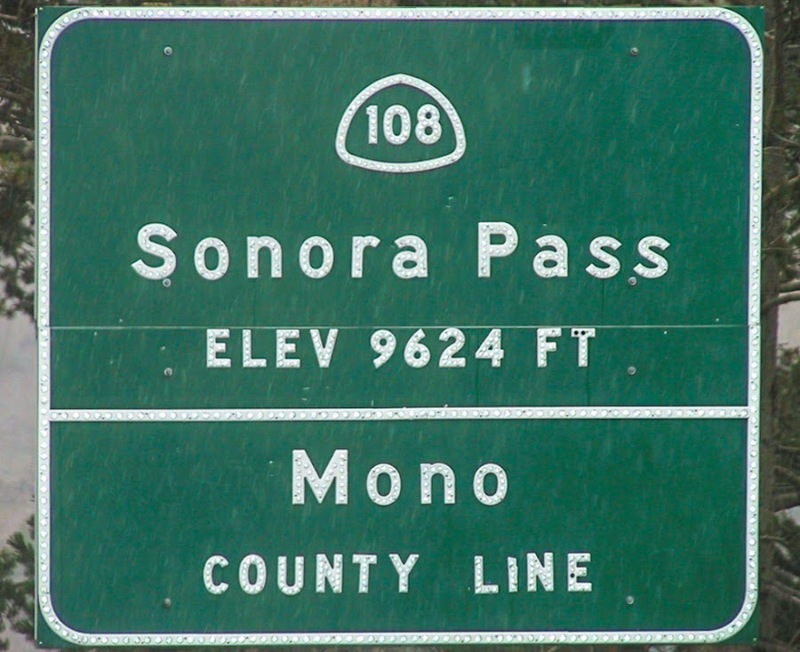 Then, as we climbed up over the Sonora Pass, it started to snow. Not a great beginning, but it wasn't a big storm and we made it through. It started snowing as we drove over the mountains. This is a car on the road in front of us. 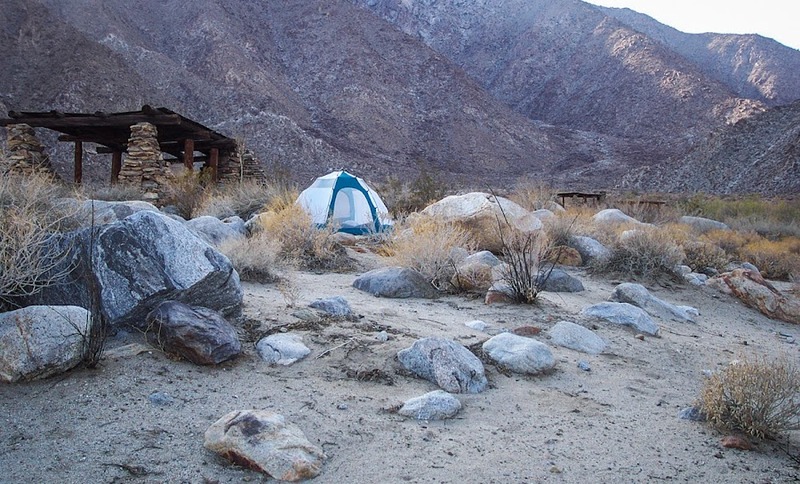 We had made reservations for the campground on line, but only for the purpose of payment. If I remember correctly, we registered on arrival by filling out a form and dropping it into a box. There were no staff, no rangers, and very few other campers. The Sonora Pass, pretty high up. A little more than 2,900 meters. We set up our tent and built a fire. We had a good dinner, then settled in for the night. It got cold, and it may have snowed a little. Our little dog Collette slept between us in the tent, but she started shivering so much that we took turns keeping her inside our sleeping bags. We all survived the night. Setting up our campsite. There weren't very many other people there. That's me in the photo. The next morning, everything was covered in ice. The first thing we did was to drive around for a while to take advantage of the car's heater. Then we went to the nearest town for a hot breakfast. 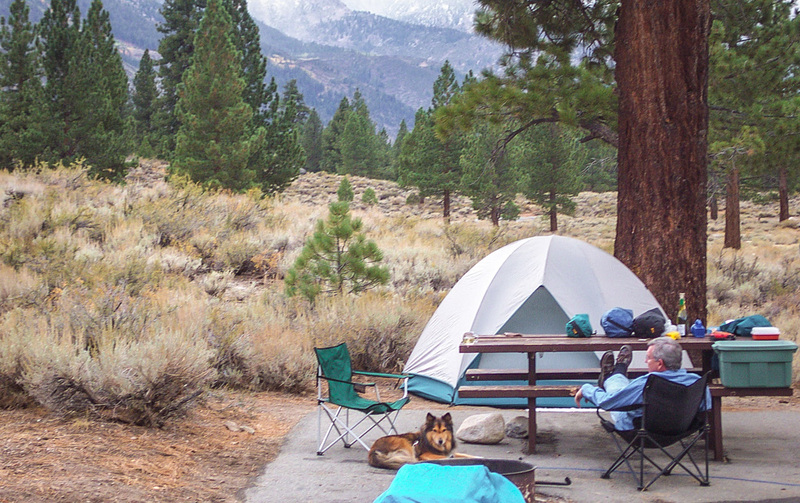 Once thawed, we decided that we could not possibly spend another frigid night in the tent. So we packed up and drove south toward Mono Lake and found a motel that would let us have the dog in the room. Thank goodness! By the way, these are Ken's photos. I was driving and he took pictures out the window. This was around the time that he was discovering digital photography. I was still taking color slides back then, but I started using one of Ken's digital cameras to see how I liked it. I'll post some of my digital shots tomorrow. Ken found some old photos on one of his disk drives the other day. I had forgotten about them. Some were photos that I took while Ken was away from home, using one of his digital cameras. These two were taken in September of 2002. We were still living in California. 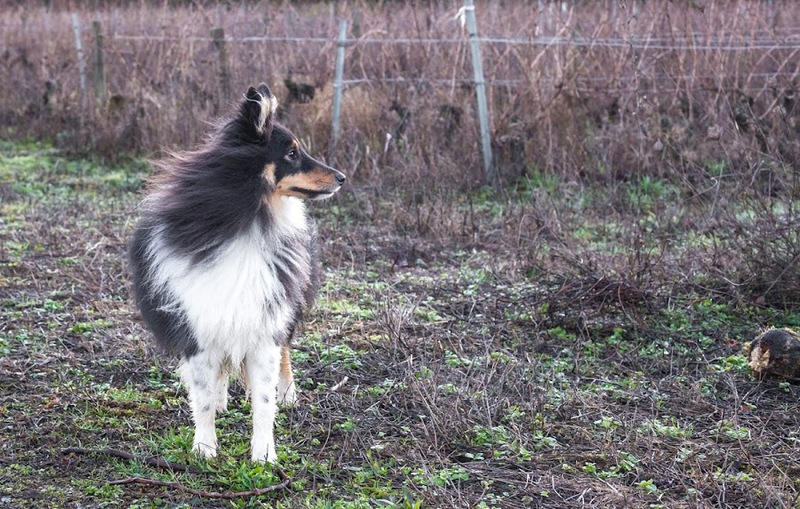 I drove up to Auburn from San Francisco to see our friend Sue, and our dog Collette came with me, of course. 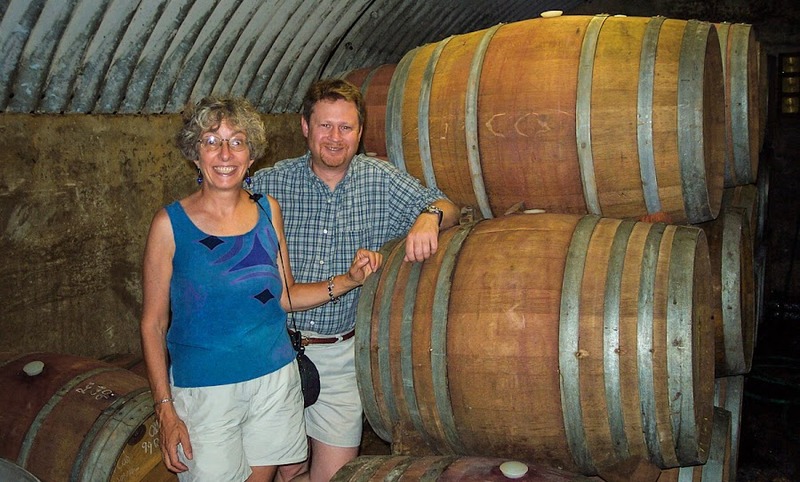 We visited a couple of wineries near Sue's house there. 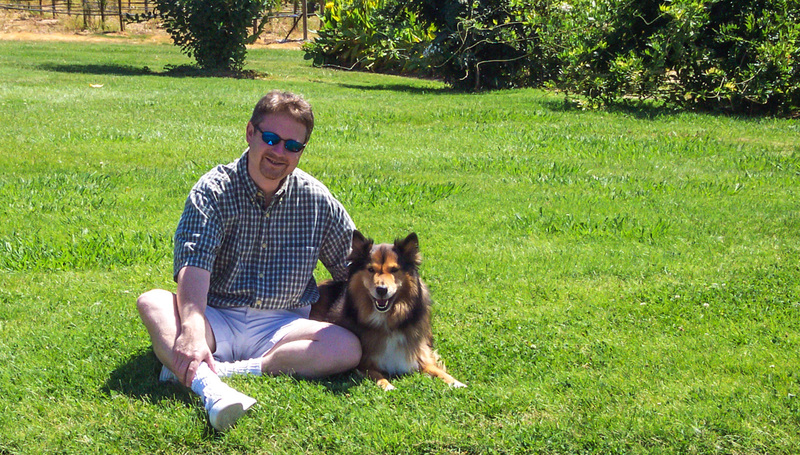 Me and Collette, happy in the grass. She was a great dog! She was 10 years old, I was 42. Obviously, I didn't take these two photos. I'm sure that Sue took the first one. I imagine that we got a winery employee to take the other one. Good times! Sue and me, happy wine tasters! It's nice to have all of these old photos. It helps me to remember all the fun we had back then. And it was great fun. You can't go back, but with photos you can remember! 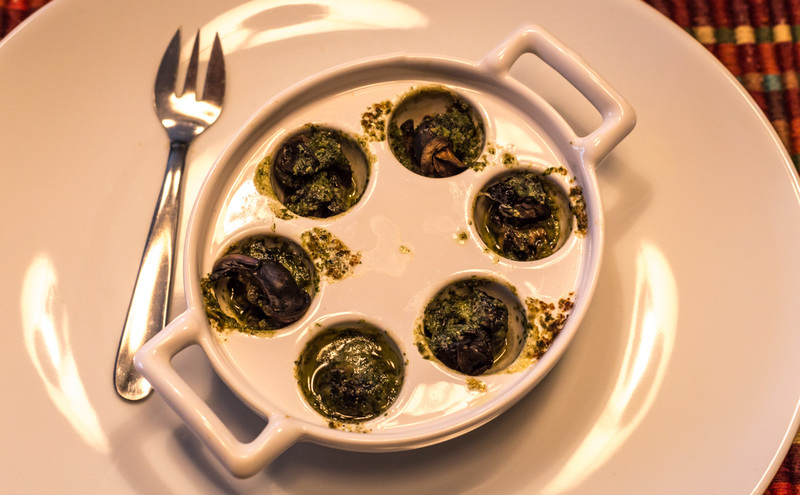 We had some snails lounging around in the freezer, so we decided to eat them on Tuesday. I thawed them out, put them in the snail dishes topped with garlic/parsley butter, and popped them into the oven for about ten minutes. They made a good appetizer for the day's lunch. A little messy, but that's what happens when you have butter bubbling in the oven. The main dish was a gratin de chou-fleur, cauliflower in a cheese sauce, browned in the oven. Ken found a nice cauliflower at the supermarket the other day. He cut it up and steamed it, then put it into a baking dish with a béchamel sauce, smoked pork lardons, and cheese, then into the oven for about twenty minutes. Comfort food! A friend gave us this bowl many years ago. It's a perfect bowl for keeping clementines in around the holidays, and other special things. The bowl was made by ceramic artist Rae Dunn in Berkeley, California. On a whim, I checked out her web site on the internet recently to see if she was still there. She is. On the back side of the bowl is her signature, in the same stamped type-face letters, followed by a period. 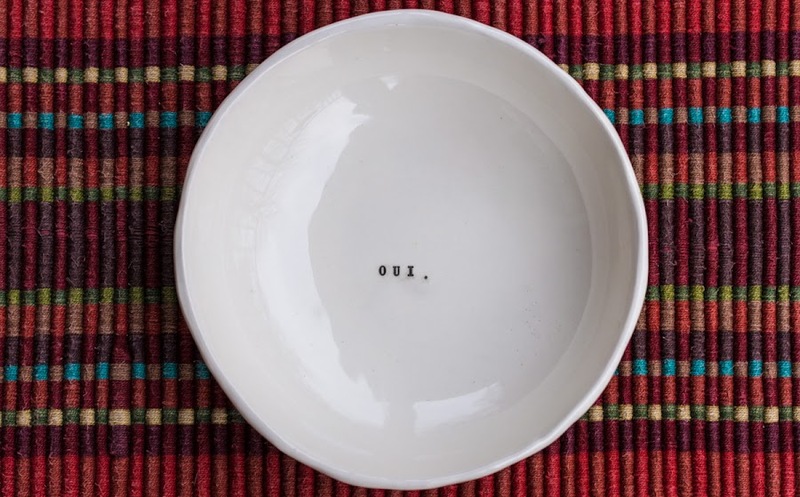 It's an interesting concept, getting to the bottom of the bowl only to see the message, "YES." But in French. It kind of reminds me of Yoko Ono's 1966 art piece that captured John Lennon's imagination. It was a ladder above which was written, in tiny letters on the ceiling, the word "Yes." People had to climb the ladder and use a magnifying glass to see the message. Not much going on right now except for cooking and watching tennis on tv. Yesterday we ground up some beef that Ken found on sale and we used part of it to make meatballs for Sunday's lunch. Today we're using another part to add to a filling for burritos. We have meatballs left over for another meal, and then the rest of the ground meat will go into the freezer. 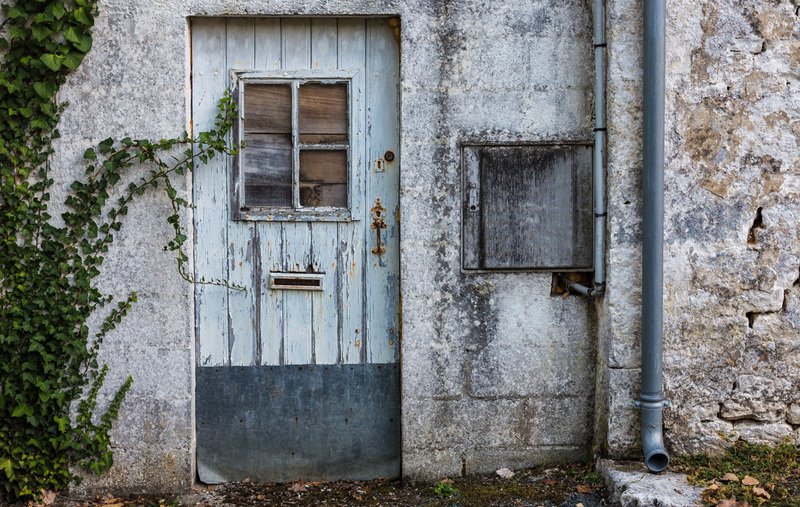 This door has seen better days. Today play begins in Sydney and Auckland, the last two tournaments before the Australian Open starts in Melbourne in a week. I don't think any of our sports channels are carrying the Auckland tournament, but we should get to see Sydney. I don't want to keep you in suspense: Ken got the fève that was hidden in the cake this year. It was a little ceramic fish (a perch) that we got in a store-bought cake many years ago. I kept those fèves from previous galettes and re-use them year after year. The cake turned out well, although it's not really a cake. It's made with two layers of pâte feuilletée (flaky pastry) with frangipane (ground almonds, egg, and sugar) in between. The finished galette, version 2019. I make my own pastry, at least for this cake once a year, but pre-made flaky pastry is available in the supermarkets. I was remembering the first time I attempted flaky pastry, back in the 90s in California. 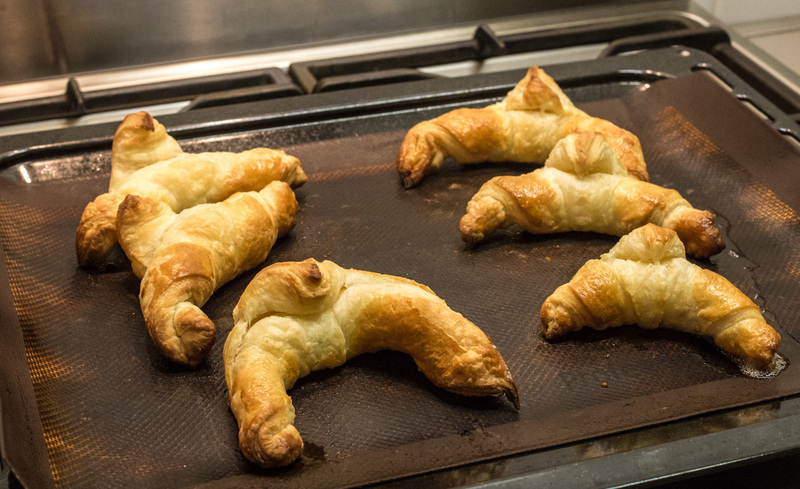 I tried to make croissants. They were a greasy disaster; I'm not really sure what I did wrong. We ate them, but they weren't very good. I was not eager to try again. The two disks, filled, assembled, and brushed with egg wash just before going into a hot oven. But try again I did, with a recipe from a French television chef I saw after we moved to France. The recipe works very well, every time, and I get a good crisp pastry that puffs up as it should. The dough is just flour, water, and salt. Then, a block of butter (250g or the equivalent of two American "sticks") that has been flattened between two sheets of plastic wrap is laid on top of the rolled out dough (without the plastic, of course). The dough is then wrapped around the butter, folded in thirds, and placed into the refrigerator to rest, wrapped in plastic again, to keep it from drying out. Here's a link to a post I did in 2012 about making the pastry. 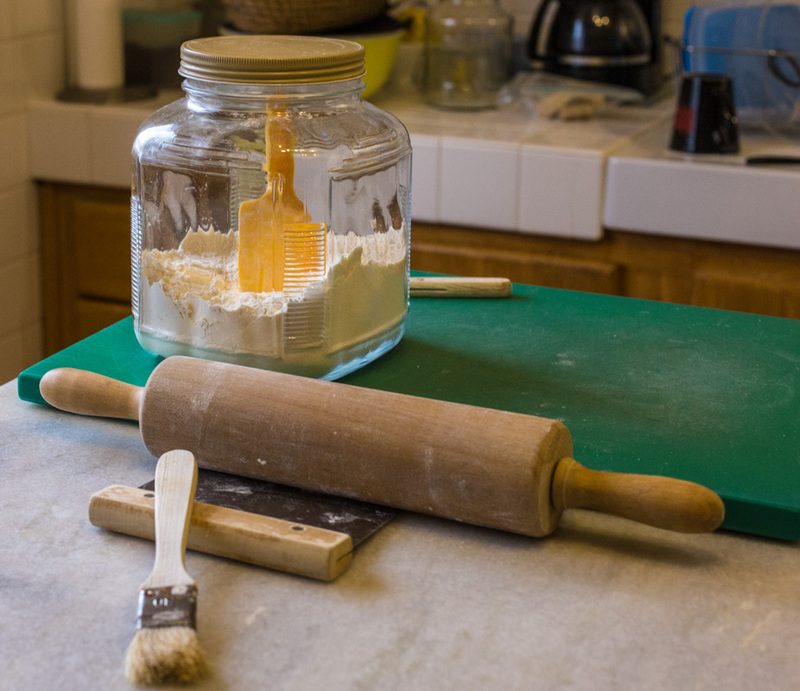 The tools for rolling and folding the dough. After a thirty minute rest in the 'fridge, the dough and butter get rolled out again, then folded over itself twice. 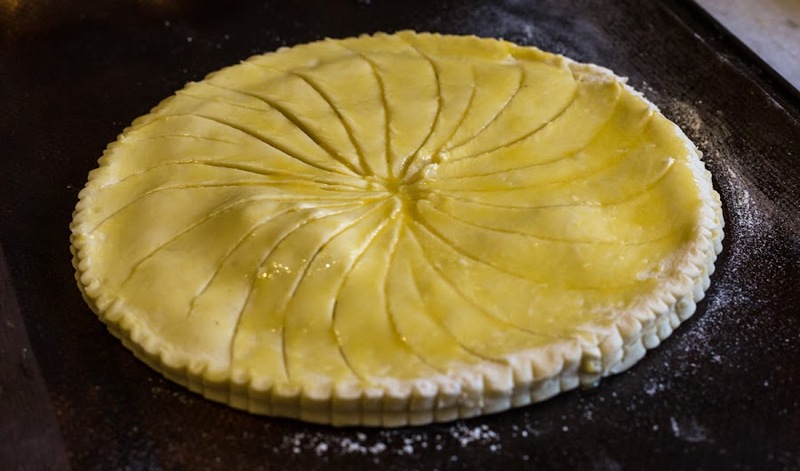 This step is repeated five or six times, then the pastry is ready for use. I cut the dough into two equal pieces, roll them out, and cut two circles using a dessert plate as a guide. I spread the frangipane on one disk, then use a beaten egg wash to stick the two disks together. It's important to use a knife to make little cuts on the edge of the cake and to make a design on top. This helps the cake to rise more or less evenly. After about twenty minutes in a hot oven, it's done! This is another one of those position markers that we see nailed to trees and posts along the vineyard road out back. They are used by hunters when they take up positions in a battue (an organized hunt). But, even though we're in the middle of hunting season, there have been very few battues in the woods and vineyards around us so far. Like, maybe one. Hunters wait at these spots for the game to be driven toward them. I'm not sure why this is. It could be that the populations of roe deer, fox, and wild boar are not large enough to need culling. Maybe their populations are more concentrated further away from us and the hunts are happening there. There is more and more development in our area that may be chasing the wild things out. The rules of the hunting season are complicated as to what can be hunted and when. From what I can tell for this season, individual hunting for wild hare and partridge is already over. Pheasants and ducks can still be hunted in our area until the end of January. As for bigger game, like deer and boar, the season lasts through February, but I believe that those animals can only be taken in organized hunts, not by individuals. Back in the fall of 1989 (! ), Ken and I took a trip through southern France. He was in Grenoble for a conference and I arranged to meet him there. We rented a car and drove through Provence, then over to the Dordogne Valley and on to the coast before turning north and back toward Paris. We passed through Cognac and stopped at the Martell winery and distillery for a tour and some tasting. 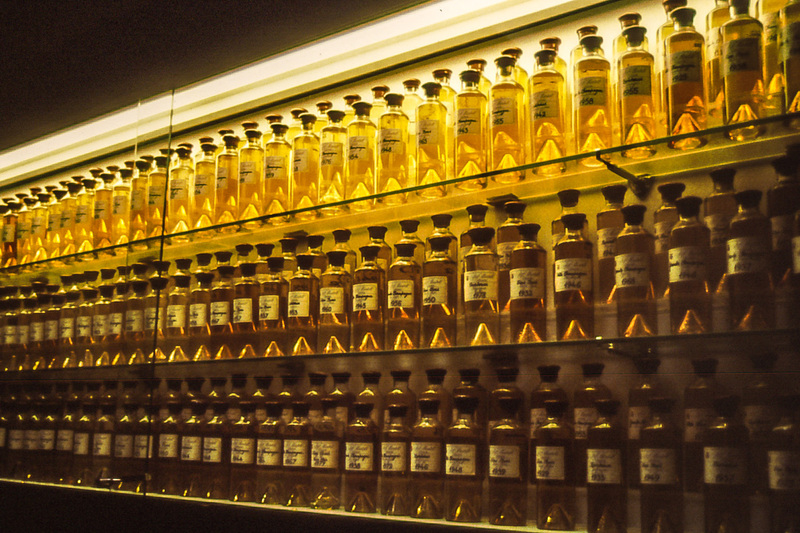 A display of vintage cognacs. Finished cognac is almost always a blend from different vintages or, in some cases, different vineyards. Back then, I was taking color slides with a Pentax camera, my first-ever SLR. I've since scanned and digitized many of those old slides and posted them on this blog over the years. I posted a smaller version of this image in 2007 (eleven years ago! ), but here it is again a little larger. 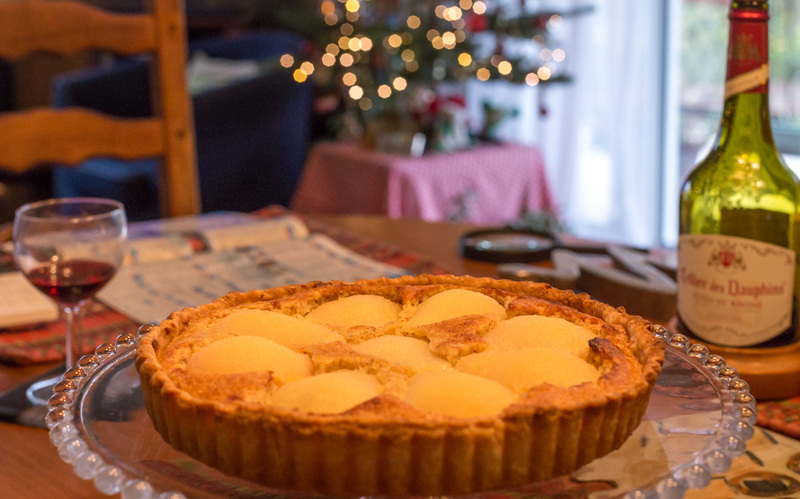 For New Year's Day, I made a favorite dessert of ours: une tarte amandine aux poires (an almond tart with pears). It's an easy recipe which could be made even easier with a ready-made crust. I don't mind making my own crust, so I did, and pre-baked it before mixing the filling ingredients. The recipe uses canned pear halves, so there's no need to peel and prepare fresh fruit, although you certainly could if you wanted to. The tart looks a little too yellow in this shot because of the lighting. It was a dark, overcast day. The filling is made with ground almond flour, a little all-purpose flour, sugar, eggs, and butter. I added a shot of pear liqueur for some additional pear flavor. Once the filling was in the pre-baked shell, I arranged the pear halves on top and baked it all for about half an hour. Delicious!